The Wi-Fire Dashboard provides the marketing tools you need to actively promote your business and generate ROI. 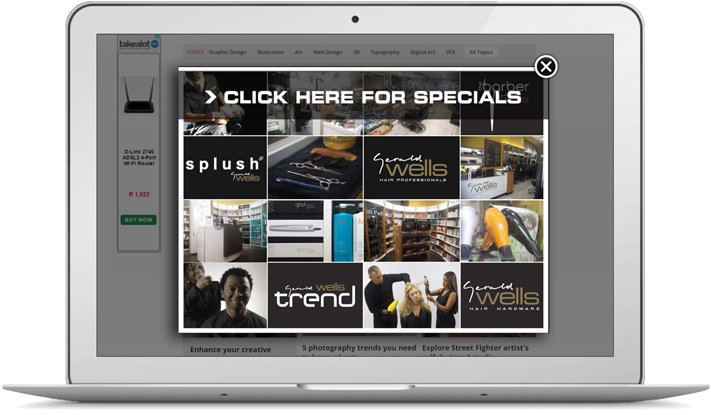 You can customise your splash pages with specific branding and advertising. The data collected at registration is also completely within your control, and can be used to create an opt-in marketing database. 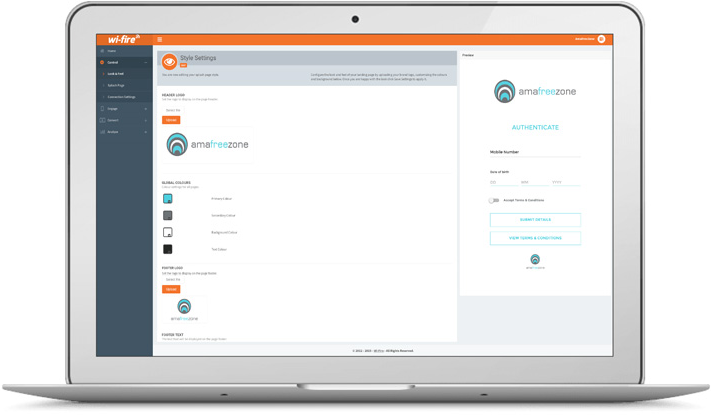 Control what visitors see when they connect to your free Wi-Fi hotspot and pave the way for content delivery and digital experiences through splash page placeholders. Tailor your Wi-Fi splash page to meet the needs of your business by using the simple editor built into the Wi-Fire Dashboard. Upload your logo, manage text and colour schemes, add social media and custom links, add a survey or even an advert, and you’re ready to go. It really is that easy. You can also create splash page and in-browser adverts to engage with your customers in real-time, based on behaviour and demographics. Display call-to-actions where your customers’ attention is; in their browser, and ensure that you deliver the right message to the right customer at the right time. The Wi-Fire Dashboard allows you to create and manage marketing campaigns individual to your audience. 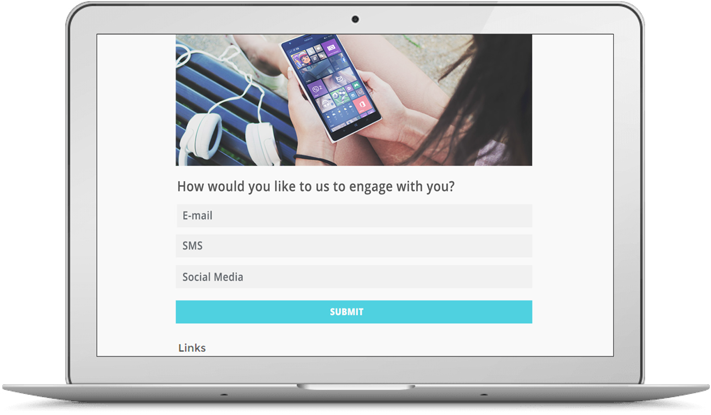 From banner and full page ads to surveys and text ads, you decide how to engage with your audience. Marketing campaigns can be targeted by age, gender, LSM, lifestyle interests, product interests, and geography. Use Wi-Fire’s analytics tool to measure the performance of your Wi-Fi marketing campaign against sales performance for a true ROI comparison. Targeted marketing creates opportunities for conversion. Wi-Fire’s customer conversion tools enable you to convert visitors into customers and build customer loyalty, all through their mobile device. Hot leads are created in real-time directly from in-browser marketing and pushed to you via email or API. Allow customers to request more information when it suits them and follow up with a call to close the deal. 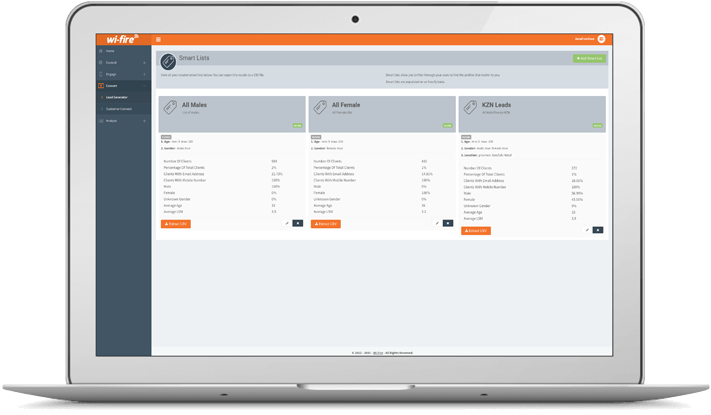 Smart Lists allow you to collect and arrange your leads by different customer profiles. Export them for SMS and email campaigns that bring feet back to your store. Copyright © 2016 – The Blake Group. All rights reserved.